Pink Dolphins Really Do Exist! Pink Dolphins may be rare, but they really do exist! Not only do they really exist, but there are several different types of pink dolphins. Pink Bottlenose Dolphins are actually albino dolphins, but they are commonly referred to as pink dolphins simply because they are often pink. 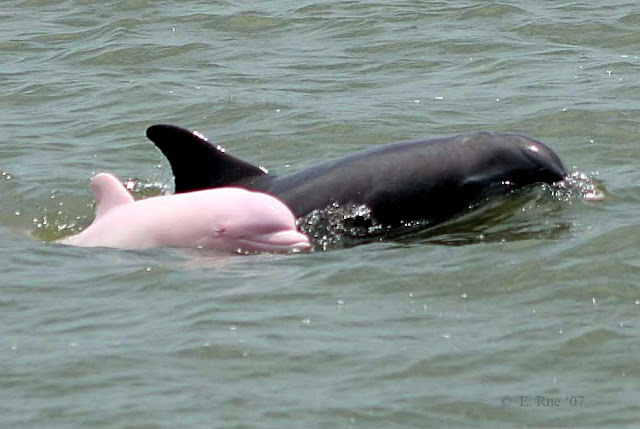 The pink Bottlenose Dolphin is extremely rare. 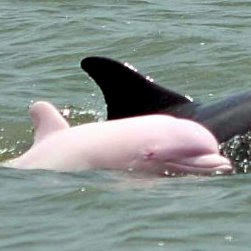 Amazon River Dolphins and Chinese White Dolphins are also commonly referred to as pink dolphins. I have included facts on all three species here so you can easily compare them, plus see photos of each one. This photo was taken in 2007 by Capt. Erik Rue, a charter boat captain from Lake Charles Louisiana, when he spotted this little beauty in Calcasieu Lake in Southwestern Louisiana. Capt. Erik Rue's Calcasieu Charter Service notes on their website that there was a sighting of the pink dolphin as recently as 9/2016. According to Capt Rue, the pink Bottlenose Dolphin appeared to be a "youngster traveling with mama." This is an amazing shot! You can even see the dolphins pink eye! It really makes me want to run right on down to Lake Charles, Louisiana and book my charter with Capt. Rue in the hopes of seeing this sweetie! When Pinky was sighted in September of 2015, there was speculation that she may be pregnant. When and if this is confirmed, I will let you know. Thank you Wednesday Elf for reporting that Sept sighting to me so I could add this update. 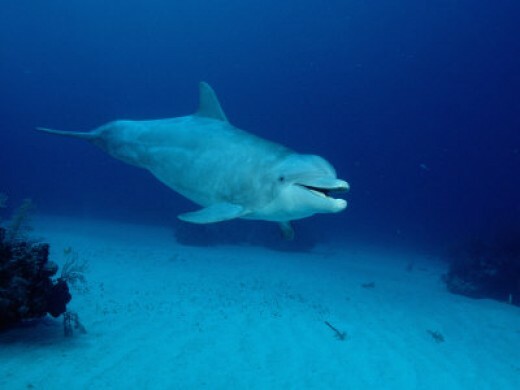 According to NOAA (National Oceanic and Atmosphere Administration), there have only been 14 recorded sightings of albino bottlenose dolphins throughout the world, since the first reported sighting in 1962. One of the Most Intelligent Mammals on Earth! Beak: Short and Stubby thus "Bottlenose"
They can frequently be seen in bays, harbors, lagoons, estuaries, and river mouths. Because of this, scientist believe there are two ecotypes: a coastal form and an offshore form. Beautifully Crocheted by our Own Wednesday Elf! On Sept. 12, 2012, I received a very special email from a fabulous crochet expert, Wednesday Elf! This is a direct quote from that email. "I wanted to thank you for your Pink Dolphin article which gave me the terrific idea to create one in crochet." 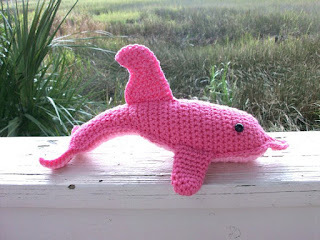 Wednesday Elf's pink dolphin is absolutely adorable and she has been kind enough to offer it for sale on Etsy. Now, we can all have our very own Pink Dolphin to hug! Thank you Pat aka Wednesday_Elf! Your pink dolphin is totally precious! Lives in: Brazil, Bolivia, Colombia, Ecuador, Peru, and Venezuela. A beloved treasure of the China affectionately called "mermaid, "aquatic panda" or even "Macau fish" after the local marine goddess "Macau." The Chinese White Dolphin was chosen as the mascot by the Hong Kong government during re-unification. Weight: Up to 500 lbs. Listed in the Convention on International Trade in Endangered Species of Wild Fauna and Flora (CITES) Appendix I. Appendix I includes species threatened with extinction. Trade in specimens of these species is permitted only in exceptional circumstances. Find Out More About Pink Dolphins Or Grab One Just for Play! I love coming to this site. You always find the most interesting animals that we've never heard of or seen. Pink, blue and white dolphins ... rare beauties, but certainly not surprising with how God does things. This has long been one of my favorite articles. It was so fascinating to learn that there are actually 'pink' dolphins in the world and it gave me the idea to create one in plush crochet. I thank you for featuring my crochet creation in this wonderful story.